South side of 218 Dartmouth SE. 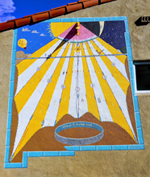 Can be viewed from public sidewalk, and there is no problem walking up adjacent driveway to view it. The designer notes,"Actually completing this medieval science project has taught me more than all the years I spent studying them. Hopefully you’ll get enough inspiration to start a project of your own. In fact, the goal ... is not to show off my dial, but to encourage others to make their own. May a thousand sundials bloom!" Who am I to judge time? December, 2018 issue of Sky & Telescope magazine.